The musculoskeletal systems of our bodies thrive on being on the floor. As a Manual Therapist, I am continually recommending for clients that they integrate a simple Yoga practice into their health routines, especially poses that require one or both arms to contact the floor. 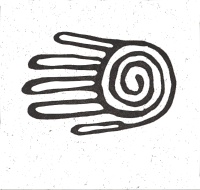 I recently encountered the “5 Tibetan Rites”, a simple variant of ancient Yoga practice that is easy to incorporate into ones daily routines, and embody this concept of arm contact with the floor. 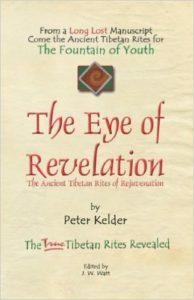 The Rites were first written about in 1939 by Peter Kelder in his book “The Eye of Revelation: The Ancient Tibetan Rites of Rejuvenation”1. This is a great little book, which is historically significant for its role in the introduction of holistic concepts of health to the west. The five rites look easy, but are actually surprisingly challenging. I recommend that you do each position only up to just before the point at which you experience strain or muscle shaking2. You will find that with repeated practice, your range will soon increase. A: With the exception of the first exercise, these exercises are homologous, meaning that they engage the upper and lower body symmetrically. Homologous movements stimulate our most ancient, pre-vertebrate, animal/motor reflexes. 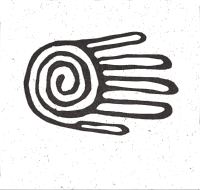 The 5 Tibetan Rites are the first set of exercises I have encountered that isolate this fundamental neurological system, which emerged while animals were exploring the foundations of movement (along a line). 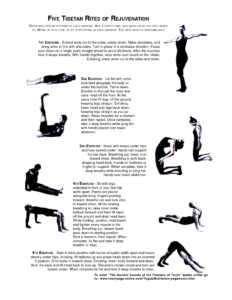 Most exercise sets from Yoga etc. blend these with heterolateral and homolateral exercises which engage our much more complex reptilian and mammalian neurology. I have observed that stimulating this foundational homologous neurology influences the fluidity and ease of the entire animal motor architectural edifice, which in us culminates in bipedal gait. Evolution and Exaptation> explain how more complex movements are built on top of, and from attributes of more primitive systems. The described “miraculous” effects of doing the exercises mentioned in “The Eye of Revelation” could result from improved global motor system efficiency, freeing additional energy for biological housekeeping tasks which we consequently experience as enhanced vigor and vitality. Following this line of thought, the Yoga “Child’s Pose” would be another exercise in this set, and I usually include it when doing the 5 Tibetan Rites. B: The first Rite is standing, clockwise rotation of the body. I find this most rejuvenating. However, this is the same direction that water spirals down a drain and it is possible that there is a correlation. If so, it very well may be the case that in the southern hemisphere you would rotate your body counterclockwise. I do not know, but recommend that if you live south of the equator, that you experiment with both directions, and do the one which makes you feel stronger. 1: The BBC series “Indian Summers” is set in colonial India a few years earlier than this publication date, and watching the series offers fun and fascinating context for Peter Kelder’s transmission of these exercises. 2: Stopping the exercise before the point of muscle shaking is somewhat controversial. I base this statement on my understanding of neuromotor development, where the shaking is considered compensatory. When we are in compensation, we do not learn and the exercises will not increase vigor (but possibly muscle mass). By working only up to the point before which the shaking starts, we will gradually move far beyond that point in our competency.